The Calgary Roughnecks will look to build upon their home opener victory this evening when the Colorado Mammoth visit the Scotiabank Saddledome for a New Year’s Party that features post-game fireworks. New this year, the party in the Rough House begins with a $5 Happy Hour featuring food and beverage specials on the concourse. The $5 menu will run from 5:30 – 7:00 p.m. during all nine weekend home games. The Roughnecks last hit the turf on Dec. 15 when they defeated the visiting Vancouver Stealth by a score of 15-12. Two six-goal quarters powered Calgary past the Stealth. Leading the offensive surge for the Riggers was alternate captain Curtis Dickson with three goals and a trio of helpers. Holden Cattoni and Riley Loewen also added hat-tricks in the win. Frank Scigliano went the distance between the pipes for Calgary, turning aside 51 of the 63 shots he faced. Colorado hosted Georgia in Week 3 action, earning a 14-11 victory over the visiting Swarm. VS. COLORADO: Tonight marks the first of three regular season meetings between the two West Division rivals. Last season the Roughnecks held the advantage in the series, picking up two of three wins. Meanwhile, Colorado edged Calgary by a combined score of 38-35 in the three matches. The Riggers are 6-4 in their last 10 home games against the Mammoth. Next regular season meeting: Saturday, Feb. 10 at 7:00 p.m., in Calgary. Jan. 20/17 at COL: CGY 14 COL 12 … It was a milestone evening for Calgary forwards Dane Dobbie and Tyler Digby who combined for 10 points in the win. 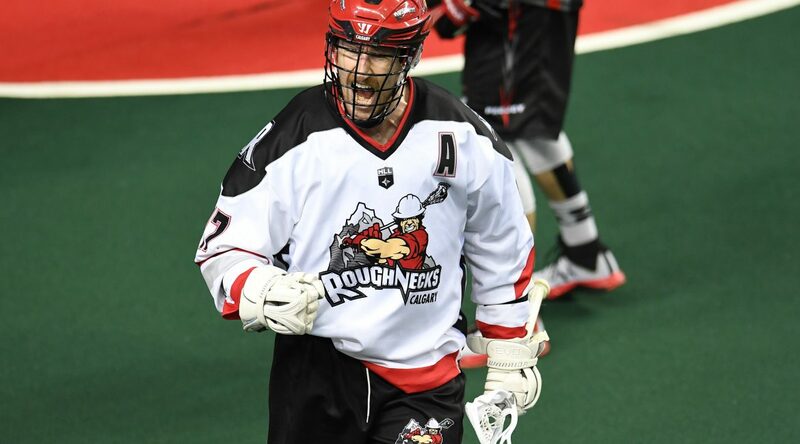 With his first of two tallies on the night, Dobbie became the 25th player in league history to record 300 career goals and first player in franchise history to score all 300 as a member of the Roughnecks. Digby, with a five-goal effort including the game winner, reached 100 career goals in only his fourth NLL season. Jan. 28/17 at CGY: CGY 12 COL 8 … Jeff Shattler became the franchise’s all-time leading scorer (629) with a first-quarter assist while Dane Dobbie had a first-star performance with a game-high seven points (3g, 4a). The victory marked Calgary’s first home win of the season. Mar. 3/17 at COL: COL 18 CGY 9 … The Mammoth turned three five-goal quarters into an 18-9 triumph. Backstopped by Dillon Ward’s impressive 50-save effort, the Colorado defence held the visiting Roughnecks to just three goals in the second half. *Note: One loss was against the Washington Power in 2002. FAMILIAR FACE: Defender Scott Carnegie returns to the ’Dome this evening for the first time as a member of the opposition. Scott and his older brother Mike both began their NLL careers with the Roughnecks in 2008. Scott played 130 of his 132 career games with Calgary while Mike recently played his 159th contest for the Riggers. COACH’S CORNER: Curt Malawsky, named assistant general manager and head coach ahead of the 2013 season, has guided the Roughnecks to 45 wins. He is one win back of duplicating the late Chris Hall’s record (46) and two victories away from becoming the most winningest coach in franchise history. Hall led the Riggers from 2002-07. MILESTONE MARKERS: Defenceman Curtis Manning eclipsed 500 career loose balls and reached 100 career caused turnovers in Calgary’s home opener on Dec. 15 against Vancouver. Goaltender Frank Scigliano suited up for game no. 100 that same night. TRADE WINDS: Dec. 7 – Roughnecks acquired a fifth-round pick in the 2018 NLL Draft from the Buffalo Bandits in exchange for 25-year-old forward Vaughn Harris. Calgary selected Harris in the second round, 15th overall, in 2016. He suited up for two games with the Riggers last season. LEADER OF THE PACK: Defender and transition player Dan MacRae is wearing the ‘C’ for the 2017-18 season. He succeeds Bruce Alexander (2002), Tracey Kelusky (2003-10), Andrew McBride (2011-15) and Mike Carnegie (2016-17) as captain. MacRae, who served as alternate captain from 2016-17, has spent his entire eight-year playing career with the Roughnecks. The Oakville, Ontario, native has appeared in 111 career games, recording 81 points (18 goals, 63 assists), 119 caused turnovers and 528 loose balls during that span. Calgary selected the 29-year-old defender in the first round, sixth overall, in 2010. This summer he completed his first season as head coach of the OLA Jr. A’s Burlington Chiefs. A TEAM: Defenceman Greg Harnett and forward Dane Dobbie return as alternate captains for the 2017-18 season while forward Curtis Dickson will don an ‘A’ for the first time this campaign. Dobbie, the franchise’s all-time goals leader (336), is playing in his 11th season with Calgary. The 27-year-old Harnett is beginning season seven with the Riggers. For Dickson, the 2011 NLL Rookie of the Year, 2017-18 marks campaign eight in Calgary. DID YOU KNOW? : Calgary’s 15-12 victory over Vancouver on Dec. 15 marked the first time the Roughnecks have defeated the Stealth in six home opener meetings. ROUGHNECKS VS.: (BUF 0-0), (COL 0-0), (GA 0-0), (NE 0-0), (ROC 0-1), (SAS 0-0), (TOR 0-0), (VAN 1-0).